Buddleja Linn., Sp.Pl. 112. 1753. Gen.Pl.ed.5:51.1754; C.B.Clarke in Hook.f.,Fl.Brit. Ind.4:81.1883; Brandis, Ind. Trees, 475.1911; T. Cooke, Fl. Bomb. Pres. 2:182.1904; Bailey, Stand. Cyclop. Hort. 1:585.1919; Parker, For. Fl. Punj. ed. 3:352.1956; Tutin in Tutin et al, Fl. Eur. 3:202.1972. Shrubs or small trees. 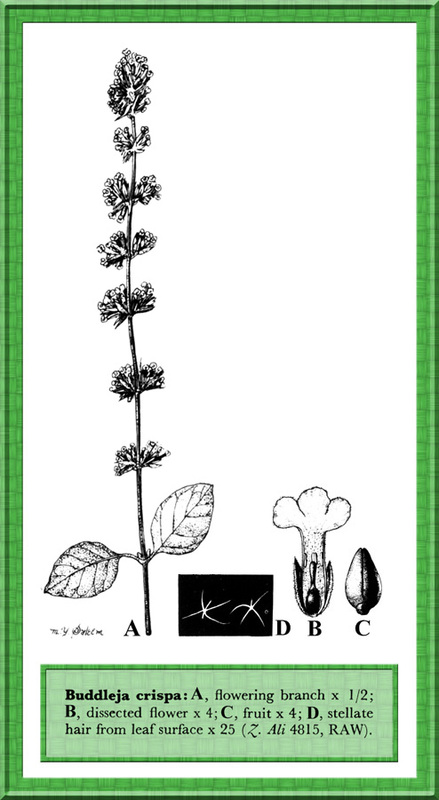 Stem usually tomentose. Leaves opposite; margin entire, crenate, or serrate; stipules interpetiolar or reduced to a ridge. Cymes many-flowered, arranged in branched spikes. Calyx campa¬nulate, 4-lobed. Corolla tube cylindrical; lobes short, spreading, imbricate. Stamens 4, inserted on the corolla tube; filaments short; anthers included or slightly exserted. Ovary bi-locular. Capsule 2-valved. Seeds numerous. A genus of about 100 tropical and sub-tropical species distributed mainly in E. Asia, America and S. Africa. Represented in W. Pakistan by 4 species. Buddleja neemda Ham. ex Roxb. = Buddleja asiatica Lour. Buddleja variabilis Hems. = Buddleja davidii Franch.